The 2019 season will be Coach Novotny-Beaver's 11th season as Head Coach of the Lady Falcons. The 2018 Lady Falcons finished the 2018 regular season 7AAAA Region Champs at 11-1. The Lady Falcons have made a State Playoff appearance for the last 5 consecutive years. The Lady Falcons made their first 8AAAAA State Tourney appearance in 2014. The Lady Falcons fell to State Runner-up Cambridge. In 2017, Coach Beaver was recognized by the Georgia Dugout Club for reaching the milestone of 200 wins in her Georgia softball coaching career. Coach Novotny-Beaver tok the reins of the Lady Falcons in December 2009 as the new Head Coach. Coach Novotny-Beaver's career coaching win total is 228 games in 18 years as a Head Coach. 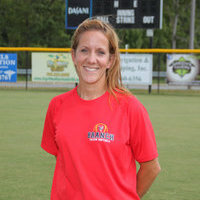 Coach Novotny-Beaver came from St. Pius X Catholic High School in Dekalb County where she served 7 years as the Head Coach. Her 2007 team reached the Elite Eight and headed to Columbus for the first time since 1998 and finished with a final ranking of 7th in AAAA. In 7 years as Head Coach at St. Pius Coach Novotny-Beaver complied 92 wins, three region runner-up placements and numerous tournament Championships. Coach Novotny-Beaver was named 2007 Dekalb County Coach of the Year. In high school, Coach Novotny was a four sport (basketball, track, volleyball, softball), four year varsity letter winner, three time All-State selection in softball from Boone, IA. She received the Defensive MVP Award at the Iowa All-Star Game and was named 1989 Iowa Softball Player of the Year for all classifications. Coach Novotny played Division I softball (on a scholarship) Coach Novotny received numerous Conference Awards as well as setting many University individual school records that are still standing today (including career triples (24), game hitting streak (14), and triples in a season (11). At FBHS, Coach Novotny-Beaver currently works as the FBHS AP Coordinator, and Administration Assistant and within the Social Studies Department she is teaching AP United States History and AP Psychology. Coach Novotny and her husband Ron live in Gainesville, GA with their son, Jake (15), and daughter Casey (12). Mrs. Novotny-Beaver completed a M. Ed. in Leadership and Administration in 2010. Mrs. Novotny-Beaver received her BA from Georgia State University Department of Education in Broad Field Social Sciences (histories, geography, political science, economics). Mrs. Novotny-Beaver also received a BS in Criminology and a Minor in Coaching from the University of Northern Iowa.